Prawn dishes are always inviting ones with my kids,what about yours if they eat prawns? ?Prawn curries,fries,dry dishes are all delicious to go with steamed rice and even chapathis too.Chettinadu recipes are full of spice flavors and that makes it unique too.Though the ingredient list may look long but this curry doesn't require any extra efforts or time unlike many other long recipes.The steps are simple and the curry serves good with steamed rice and even chapathis too.The pics haven't shown justice to this recipe as its winter here and the lighting is very poor outside,will update as and when I make again.Do give this a try if you are a avid fan of chettinadu recipes and enjoy !! For all sea food delicacies,click this link. Clean the prawns,de vein and rub the prawns with salt and lemon juice.Leave aside for 10 minutes.Then,wash under running water for 5-6 times.Drain the water and marinate using pepper powder,turmeric powder and salt.Leave aside for 30 minutes. In a pan,dry roast all the spices listed under 'roast & grind' on low flame.Make sure you don't burn the spices.When cooled,grind the spices in a blender until coarsely powdered or fine powdered. Soak tamarind in half cup water,squeeze out the pulp.Keep aside. In a wide bottomed pan,heat oil.Splutter mustard seeds,add hing and ginger garlic paste followed by onion and green chillies.Saute until onions turn translucent and soft. Now,add chopped tomatoes and cook until mushy. Slide in the marinated prawns and cook until soft for about 3-4 minutes,the color changes to whitish pink. Add the tamarind pulp and half cup water,salt to taste.Cook and simmer for 2 minutes.Add the grounded masala(2 tsp) and then cook covered for 5-6 mins until the gravy turns thick and oil floats on top.Switch off flame,garnish with chopped cilantro and serve warm. * This yields a moderately spicy curry.Increase spices if you want really hot fiery curry.If you wish a milder one,then omit the green chillies too. 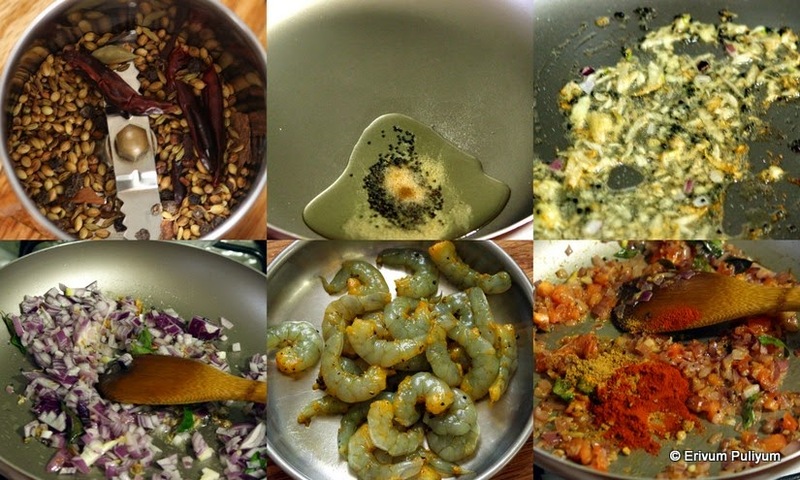 *You can use any kind of prawns to make this curry. delicious curry, love prawn in any form.. Sounds like a flavorful curry! Such tempting curry with tempting pics!!! I just love this!! Its an visual treat! Mouthwatering, reminds me of the curry Mom makes. Yum!!! I love everything with prawns in it. This looks amazing! This bowl of shrimp looks very delicious Julie! I used to have this but without gravy , remind me old times. looks delicious. My kids love prawns. I have to give this recipe a try. My little one doesn't handle spices that good, but he can enjoy them with yogurt. I will definitely try this recipe.